leading a bible study on Thursday nights under a mango tree, where about 10-12 believers met to encourage one another and share in God's truths. The tent that the church at Guitton had been using prior to their building dedication was no longer needed in Guitton. With the progress being made on clearing off the land in Kamitan Wednesday afternoon, Frank sent a group of us to the church property Thursday morning to take the large tent down, and move it there. About 15 of us walked to the church at Guitton, and Shane Clark led the group in taking down the large tent as if he had done it 100 times. We got it down fairly efficiently for all first-timers... It was a large heavy canvas (folded up, about the size of a large roof-top car luggage carrier), so we took two support poles and maneuvered them under the canvas and carried the canvas to the truck like we were caring the Arc of the Covenant across the Jordan River (we actually did carry it over the 2 foot wide aqueduct…). With the tent in the back of the truck, the group walked back to the SMI house around 10:00. There was only room for a few guys to get in the back of the truck (the canvas took up nearly all the truck bed) and deliver the tent to the property at Kamitan. Some of our men and a couple of students delivered the tent and worked with 30+ Kamitan villagers to put the tent up. 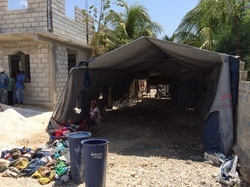 They reported to us that the Haitians were working hard to clear off the property and level it off in preparation for the tent. They said that after the tent had been spread out, and the poles laid out, that it almost worked perfectly for there to be one person there for each pole on the tent. They said the process was God-breathed, and that the people of Kamitan were taking ownership of the process. Even though everyone wasn't able to go help put the tent up, we all felt like we were a small part of something amazing that God was doing. 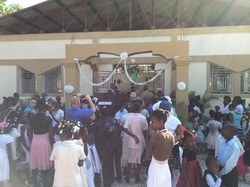 God was planting a church in a village in Haiti where a church didn't exist. Thursday afternoon was our 'play day' at the beach. At around 1:00, the guys that went to Kamitan were returning, and we set out for the beach at Moulin Sur Mer. This was a former sugar cane plantation, and had the most manicured lawns that we saw in Haiti. On the way back, Frank took a small group in the SMI truck to Kamitan, where they were now able to hold their Thursday night bible study under the tent. 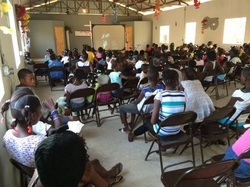 Several villagers brought chairs, and it looked like they had 12-15 people at the Thursday night service. We were excited. We knew God was at work in Kamitan! The original plan was to go back to the Bon Repos Orphanage all day on our last day; however, everyone in the group wanted to go see the tent that had been set up in Kamitan for the church there. 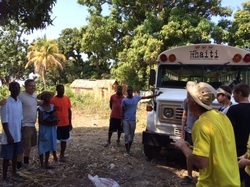 We loaded up in the bus, and when we arrived, there were at least 20 Haitians out clearing the land and shoveling and spreading white rock that had been delivered to be the floor for the large open air tent. We also were going to add and tighten the support straps around the tent. At the first opportunity when a Haitian dropped a shovel at the rock pile, I grabbed it, because I wanted to participate all I could. There were four of us, and we could fill the wheelbarrow fairly quickly. Loading the wheelbarrow didn't take much skill, but the villagers with the rakes and shovels that were spreading it out on the floor were taking tremendous pride in their work. 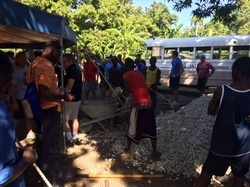 While the other men and older guys were going around tightening the straps around the tent, Frank asked all the students (and the Haitian children that were there) to collect rocks larger than softball size and they laid the rock around the outside to create a perimeter for the smaller rock. At first, I wondered where in the world they would find enough rocks that size, but rock is one thing that is not scarce in Haiti, and that whole job was completed in under 30 minutes. 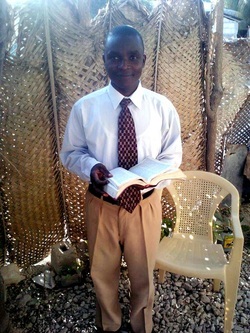 Because some of the villagers had asked for one when we were there, Frank brought some Haitian Bibles. The lady who was the first believer in the area told our interpreter that she didn't read, but her children were in school, and she would have them read it to her regularly. The ones who got Bibles were so excited, and the line was longer than our supply. After the rock perimeter was finished, we decided to break into our teams and canvas the village and let them know that church would be Sunday morning at 7:00 a.m. The village was excited, and most everyone we talked to said that they would come. Pastor Alexandre from the church at Nanwòch had agreed to come over to Kamitan to lead the service. Frank told Pastor Alexandre that he was the Pastor of this church, until God brought someone else. 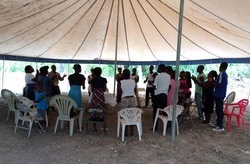 Before we left Kamitan, our group circled up with the Haitian workers, with Pastor Alexandre, and all the Haitians in the general area of the tent. We all grasped hands, and our youth pastor and Pastor Alexandre led a prayer of thanksgiving for all that God had allowed to happen the last 48 hours in Kamitan. I made it a point to hug the two Haitian men whose hand I held during the prayer. The vision of that circle praying under the edge of the tent is a memory that I hope I never forget. I got to pray one on one with Pastor Alexandre that day before we left. I prayed that God would give him the strength to oversee two church bodies, and that God will make much of His saving name in the village of Kamitan. 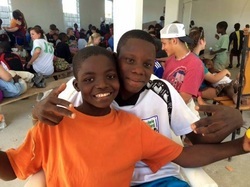 We went back to the SMI House for lunch and then headed to the Orphanage at Bon Repos. The walls on the 2nd floor were almost completed, except on the very front wall. I went upstairs for a while to carry and hand out blocks to the skilled Haitians who were laying the block. I am not sure I helped a whole lot, but they let me help anyway. I went back down to the first floor after an hour or so to play with the children. When I went down, two boys told me in broken English (they are residents of, and attend school at the Orphanage) that they were both 14 years old, and that their fathers were dead. We could hardly communicate, but we did sit together for another 30 minutes and we held hands a good bit of the time, and we sang Jesus Loves Me, and a few other songs that they had learned in English. After we sang, they asked me if I would be their father. Needless to say, that really melted my heart. I didn't want to confuse them, so I didn't really respond at that time, but I later thought "I can be your father today…"
It was difficult for us to leave the Orphanage, knowing we would leave for the airport the next morning. 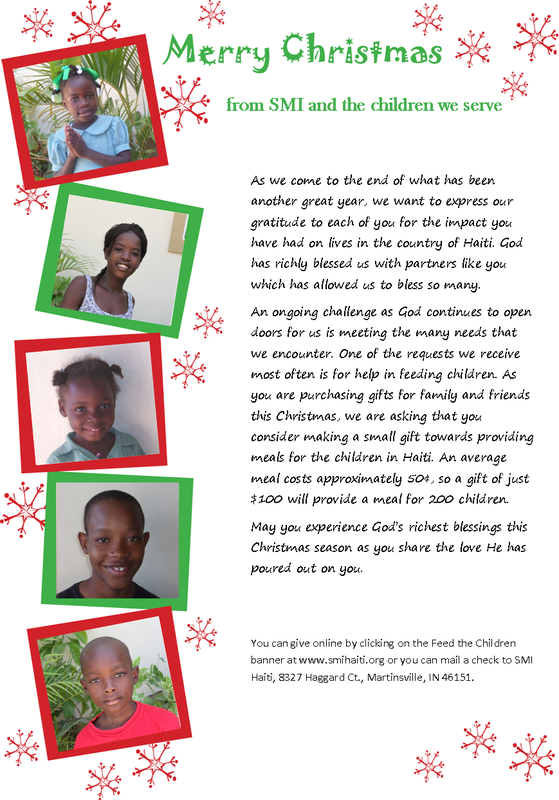 I firmly believe that if Haiti allowed it, some of the orphans would have been taken back to the US by several of our team members. 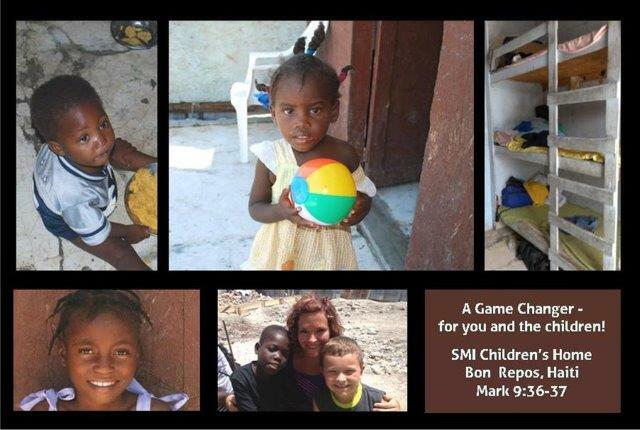 We had a 'share time' with the group back at the SMI Mission House every night between supper and bed time. Frank told us last night that we were really blessed because we were able to see the Lord do so many things this week. He said that he never knows what God is going to allow to happen each week, but there is no way he would have ever planned on his own for us to be a part of so many wonderful things. The week truly was a God thing.